Zbigniew Herbert talked about how there are cat writers and ox writers, cats being those writers who slink around for days or weeks or months until they suddenly burst into writing, oxen being those who wake early to dutifully attend to their writing every day, inspiration be damned. I think I’m a natural cat, but I work very very hard to be an ox. I wake up every morning earlier than I’d like and write into the afternoon. During the school year I teach two classes a week, so on those days I stop writing to go teach, then come back to the writing. It’s important to me to write first thing in the morning, to meet language while it’s still all gummy with dream-logic and undiminished by the mundane prattle of daily life. “My deeply unhip morning set-up”. 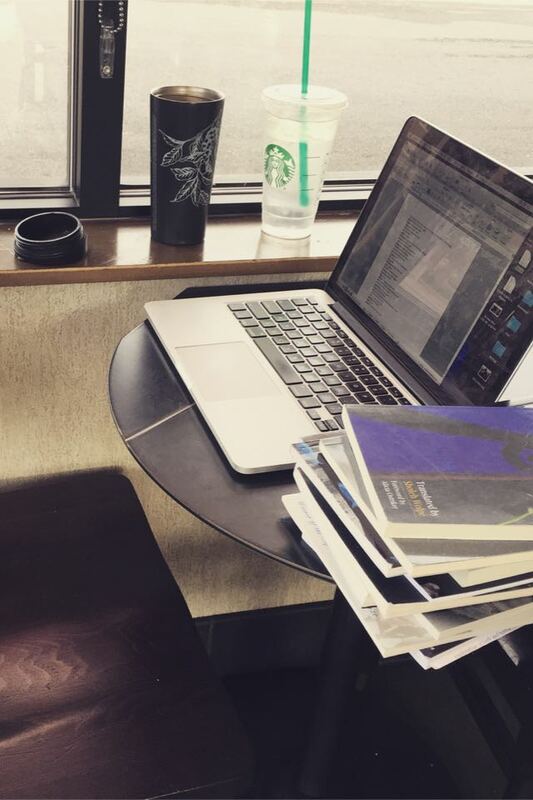 I’m a little embarrassed to admit it, but I write in a Starbucks. I’ve no special affection for Starbucks as a commercial entity, but there’s one right across the street from my little studio apartment, so I can be writing with coffee and a stack of books at my side within fifteen minutes of waking up. It’s hard for me to write poetry at home. I like the bristle of strangers stomping around me, and that at Starbucks, my cat Filfy won’t splay himself across my keyboard. Whenever I go to write, I take a dozen or so books with me. They can be anything, poetry or fiction or self-help or science or spiritual or whatever else. I spend a couple hours scanning them, not really reading anything but just picking out individual words I like and writing them down. I get a couple pages of just that, plain unrelated words and little riffs on them, before I actually try to write anything of my own. Lots of mornings I write with my partner, transcendent American poet Paige Lewis. We don’t talk much until after we’ve written, but it’s invigorating to osmotically absorb each other’s good poetry juju while we’re in the thick of it. I read once that the average person speaks 3,000 words a day, and of those only about 500 are meant to convey meaning, the rest are just filler. The word-harvesting I do every morning is a way to move myself out of my own well-trod, easily accessible vocabulary, to add an elasticity to the vernacular of my poems. I usually listen to the same albums on repeat through my writing to drown out the coffeeshop argle-bargle. For the past year or so, HEALTH’s Death Magic has been a staple. Lately I’ve been very into Shahram Nazeri, a Persian tenor who sets Rumi’s poetry to traditional Sufi music. It has to be music I can hear and tune out without actually listening to it. I think this is pretty standard for writers who work in busy places. I don’t eat anything before I write, I don’t know why. To the extent that I’ve ever been able to muster any flare of poetic virtuosity, it’s never been on a full stomach. I drink a ton of plain coffee. Way too much coffee. Like lots of writers, I struggle to make sense of what happens when I’m actually in the throes of writing. Even the least romantic of us has difficulty speaking of the process without using words like trance or describing hours magically flying by. Dorothy Parker famously quipped that she hated writing, but loved having written. I love both, the writing and the having-written. It’s the most narcotic thing in the world, a high I chase daily. I don’t know that I can say much more about it. 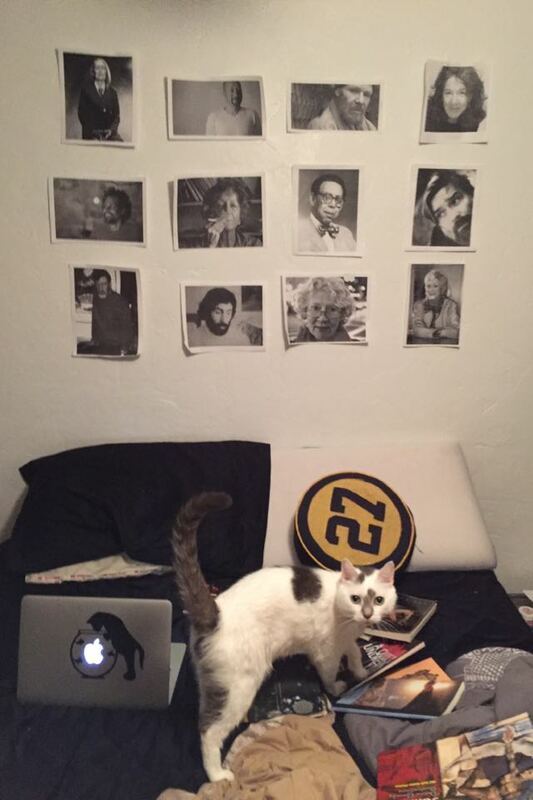 Filfy and the ‘Wall of Poets’. Once I’ve written, I usually go home and eat a light lunch, Greek yogurt or leftover pasta. Then, I pivot into work mode. I’m a Ph.D. student, I teach undergrad courses and take classes of my own, so that’s a full workload itself. Then, I also edit Divedapper , a website where I interview my favorite poets, meaning I research and conduct all the interviews, then code them all into the site myself (I have lots of help with transcription and copy-editing now, which is a blessing). I serve as Book Reviews Editor for the Southeast Review and I just started a podcast, All Up in Your Ears , with Gabrielle Calvocoressi, francine j. harris, and Jonathan Farmer. On any given day, I work on some combination of these things (or on my own submissions, or look at a friends’ poems, or write this or that essay) well into the night. At home, I don’t work at a desk. My studio is tiny, basically a big bed, a bunch of bookshelves, and a stove. I work on the bed. I’ve always liked reading and working while laying down, so my bed is my desk (it’s also my dining table and occasional bookshelf). I just got a new bed from a friend who moved, and it’s a real game-changer. I never realized how much a nice mattress improves your life. I fear I’ll never be able to go back to the crappy, comes-with-the-apartment kind. Above my bed, I keep a rotating wall of poets I’m currently obsessed with. Some have been up for years (even moving with me from Indianapolis to Tallahassee), others for just weeks or months. I like to think of them watching over me while I write, like to think of them working their wisdom into me while I sleep like sleep-tapes. Or protecting me like dreamcatchers. “There are two kinds of pain in life: the pain of discipline and the pain of remorse. Choose.” Franz Wright (a load-bearing poet of my personal canon) had this written behind the computer where he worked, and I think about it constantly. I basically wake up and do poetry in some capacity all day, for sixteen or twenty hours, seven days a week. There are things I won’t talk about publicly, dates with Paige and recovery meetings and that sort’f stuff, but by and large, the meat of my every day is poetry, spinning this or that poetry plate, writing or editing or talking about poems. It’s the life I’ve always dreamt of, and I’m in a perpetual gratitude fugue because of it. Kaveh Akbar founded and edits Divedapper , a home for conversations with the most vital voices in contemporary poetry. His poems appear, or will soon, in Poetry , Tin House , Narrative , and elsewhere. His first full-length collection, Calling a Wolf a Wolf , is forthcoming with Alice James Books in 2018, and a chapbook, Portrait of the Alcoholic , will be out with Sibling Rivalry Press in early 2017. Kaveh was born in Tehran, Iran, and currently lives in Tallahassee.